This conference is intended for university students, recent graduates, and young professionals. It is also open to those in Year 13. Those under the age of 18 must print and bring with them a consent form signed by a parent or adult with parental responsibility. The consent form can be downloaded here and once you have filled it out, please send a copy of it to conference@unistudents.eu. The registration deadline is 21 October. Late registrations may not be accepted due to conference preparations. Do your best to register early! The cost for the conference is £67 for students going to this conference for the first time. For everyone else, the cost is £77. This is regardless of the number of nights you are staying. This amount will cover the cost of printed material, lodging and meals during the conference. Payment for the conference registration is online! Once you have completed and submitted your registration form you will be directed to pay via Paypal or Credit/Debt card. Online payment is required for registration. In order to make adequate arrangements for the conference, we can only give places in the conference to those who have filled out the online form and paid. For example, if you have filled out the online registration form but have not paid before the deadline, you will not be registered for the conference. Please email conference@unistudents.eu with any problems, concerns or questions regarding registration and payment. Refund Policy: You must inform us by the end of Sunday 21st October of any cancellations. Cancellations made by end of 21st October will receive a full refund. There will be no refunds after 21st October. Friday, 2 November: Arrive by 18:00 for dinner; first meeting is 19:30. Saturday, 3 November: Meetings, group times and activities during the day. Lord’s Day, 4 November: Meeting in the morning followed by lunch. Depart at 13:30. Check out this video from a previous conference. *It will be at a different venue this year. Accommodation will be in multi-room buildings and you should expect a minimum of double-occupancy. The centre provides only a pillow, quilt (not a duvet), so bring your own pillowcase, bed linen and duvet and duvet covers/or sleeping bag. It will be cold without bedding! 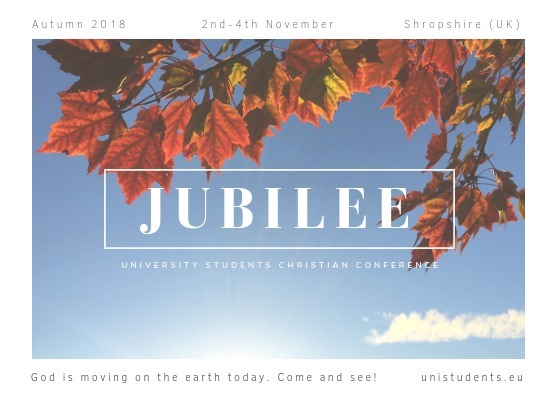 If you are unable to bring duvet and linen, you will be able to hire linen at the conference center for a £7 charge (this does not include a towel, so please bring your own). All meals on-site are included in the conference registration fee. When completing the online registration form, please only indicate medically certified food related conditions, such as allergies and intolerances. A burning spirit (Rom. 12:11) and loving heart (Mark 12:30)! There is parking available at Quinta. Shuttle service will be offered from two train stations, Chirk and Gobowen. Both stations are less than 10 minutes from the conference venue. If you are traveling by train or flying and then taking the train, please book your tickets to arrive and depart from one of those stations. Please try to arrive between 14:00 and 19:00 for the shuttle service. If your travel schedule does not allow you to arrive during this window, please let us know and we will do our best to make other arrangements for your pickup. Recommended travel route: Fly into Birmingham Airport and take the direct train from the airport to the station, “Gobowen”, where shuttle service to the conference is provided. You can also fly into Manchester or Liverpool and then take a train with a few changes from those airports to either Chirk or Gobowen. Train tickets can be booked on a number of different websites including: www.trainline.com.